I haven’t done a book review in a long time, but am starting up again with a book I received for my birthday (Thanks Mom!). I’ve followed Julie Fei-Fan Balzer at a distance for a while – pretty much since she started submitting articles for Cloth, Paper, Scissors and have bought her stencils from TCW when I can find them. I guess you could say I’m a craft-stalker, as I also follow her on Twitter and read her blog. 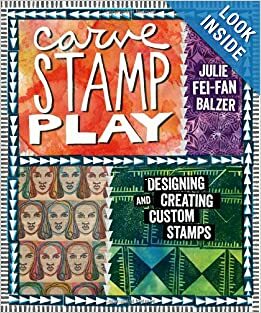 When I saw she had a book on stamp carving, I immediately put it on my wish list for Christmas/Birthday. I read it cover to cover the day it came in. First impression – great photography! There are lots of pictures covering every stage of carving a stamp plus using them in finished projects. Julie gives you an overview of the supplies and tools you need, complete with pictures so that if you have a visual memory, you can identify the items in a store by sight. She starts you out with methods to get your design onto rubber and how to prepare to carve. Then she takes you through the basics of carving in simple, easy to follow steps. Each chapter starts with a “Skills” section and includes highlights on marking the design and tips. She takes you through successively more intricate designs. There are the occasional Stamp Play Stamp Gallery sections showing you different ways to use the stamps. I’ve carved stamps for a long time, and mostly I’m self-taught. A lot of my stamps have broken, much to my dismay. Thanks to Julie, I know why! I have carved a bunch of stamps using her methods. Most of these are background stamps except for the flags (top two stamps). This is a great book, and well worth adding to your library. It is a resource that I will come back to again and again. I will have more on my stamp carving adventures in a future post. To follow Julie’s art adventures, visit her blog. Her book is available on Amazon. I fully planned to write this post last weekend, but I wore myself out, then got hold of some bad shrimp which resulted in food poisoning. On top of that, work has been a time-consuming affair since I came back from San Fran. But that’s enough excuses. Last Saturday, I dug in 5 more bags of compost into the low bed in front of my sewing room. I say dug in, but the ground was soooo hard, there wasn’t much digging. I planted more plants in the berm and the raised bed next to the driveway, some santolina in the berm, some daylillies and verbina in the raised bed. I added Oxallis and Dianthas to the low bed and then I went back in and planted thyme to start creeping along the raised bed. I built a walk way with some of the left over stone from my patio between the raised bed and the bird bath. And last, but certainly not least, I hauled 1/2 a yard of mulch over the low bed and got the other 1/2 yard out of my Dad’s pickup. I worked from 8:30 to 4pm on Saturday and completely wore myself out. My front beds are almost done, though! The cats really enjoyed working in the yard with me. Prior to all of the yardwork over the weekend, I did my Imagine entry in Susanne’s Word’s Journal. I wasn’t sure were I was going initially, but I really liked how it turned out. The two page spread doesn’t appear to be tied together, but I used the same colors in the Imagine page (right) that I used in the Excavation page (left). I added a bunch more colors on the Imagine page though. I used very different techniques between the two pages. I started with Excavation, applying a very thick layer of gesso to the page. I stamped into it with a gothic calligraphy stamp, then stamped off on the Imagine page. I wiped my gesso brush off on the Image page center. Once the gesso was dry, I used a wash of Bone Black fluid acrylic over the texture on the Excavation page, which I then wiped off the raised parts. I used successive layers of fluid acrylic in Permanent Violet, Quin Gold, Bright Copper, and a bit of Quin Burnt Orange. I used some of these same colors in washes on the Imagine page. As I got color down on the Imagine page, I decided I wanted to use a stencil of dragon flies and butterflies spiraling up concentric circles in the center. I needed a way to set it off, so I used very light washes of Naples Yellow, Quin Crimson, and Permanent Violet in the opening I’d left from stamping off. I laid the stencil down and misted Pthalo Turquoise over the stencil. I went back in with white to highlight the circles. About this time, I figured out that I was creating a sunset and added clouds in Dioxazine Purple and Anthroquinone Blue, highlight with white. I added a sun using Bright Copper, painted over with Quin Burnt Orange and Permanent Violet. I used a white crayon to write Imagine and then wiped paint off so it showed. Next up is Debbie’s Journal and “Believe”. I didn’t realize that I knew anyone in the RR besides Naomi, the organizer, but Debbie is my friend Debbie G from St. Louis! She comes to All Dolls Are Art and silk screened my bags last year. Her journal is lovely. I’m going to get it photographed and will post on that later in the weekend. This evening was spent working on the background for Life and Death. It’s not super important what the background looks like at this point, as it’s just the first layer – my foundation, if you will. It’s not quite done. I have sections to piece together yet, but I’ve done as much as I can this evening without falling asleep at the machine. I also touched up the piece of fabric paper that had the yellow blotches on it. I went back over it with pthalo green (yellow shade) and now it looks like I want it to look. Megan asked about books on fabric paper. There are two books I use as references. The first is “Mixed Media Explorations” by Beryl Taylor. She has a Cloth Paper Scissors DVD out as well that is well worth the expense as she goes into quite a bit more detail on her method there than in the book. The second book is “Stitch Alchemy” by Kelli Perkins. Kelli’s method is a take-off of Beryl’s. My method is somewhere in between and on these sheets, I’m actually doing quite a bit of the same amount of layering I do in my journal. The key points I’ve arrived at are 1 – work with very thin glue. I use a mixture that is no more than 1 part glue to 1.5 parts water. Thicker glue results in much stiffer fabric. 2 – work with small pieces of paper (less than 2” square). 3- work with lighter papers; the heavier the paper, the smaller the piece needs to be. If you want softer colors, then Beryl’s method of watering down the paint and applying when you apply the papers and the glue is the best. If you want vibrant colors, something between Kelli’s method and Beryl’s is best. Experimentation is key. It’s a lot more fun if you have everything ready to go ahead of time. You get very messy, so wear and apron and work outside if possible. To avoid mud – let your paint dry between coats if you are working with complementary colors (red-green, blue-orange, yellow – purple). If you make mud and you didn’t want it, try watered down white paint and you have an instant do over. I spent the afternoon finishing up Khamse’en’s belt and starting on her arms. She looks fantastic so far. I am extremely pleased with how this is turning out. I used some beads I found at my local bead store (I just love saying that! ), Sea of Beads. I found them online thanks to Google and stopped by there a week ago on my way back from dropping my lens off at my local camera shop to be repaired. The one highlight of my day on Friday was the call from the camera store, telling me my lens was ready. On top of the trauma with Bear this week, work was a nightmare again. It seems that, when it rains, it freaking pours. So, I’ve been on a binge of cleaning, and attempted to give away a bunch of Sommerset Studio magazines in a garage sale my parents were having. No one was the least bit interested. As soon as I get my energy and equilibrium back, I’ll do some give aways for some of them. If there is a particular issue you would like that you are missing, let me know, and I’ll see if I have it. They are still at my parents’ right now, but I’ll pick them up this week. Now, for the blog post I was going to do Tuesday night. I may have mentioned that I’m going to participate in a fabric book round robin with Gypsy Pamela, Annie, Connie, MT, epb, and Betty. My theme is the zodiac, and I’ve been hunting for inspiration for my covers. I found pictures of celestial maps from the 1600’s on Google images which were of a Taschen book, Andreas Cellarius’ Harmonia Macrocosmica. It’s a very pricy book, so I waited until I had a little windfall show up before I ordered it. It arrived Monday night in this huge box. I couldn’t wait to open it, but fed the cats first. I opened the box and found that it was half full of those inflated plastic bags that look like cellophane pillows. I dug through those to find another box. After unwrapping it, I opened it up to find this. It’s an incredible book, both for what it contains, and for the incredible feat of book binding. Luckily for me, my book shelf is just long enough for this beast to lay flat on it, which it needs. Just the act of my looking through it has already resulted in the covers developing some warping. I may have to get Wendy to make me a slip case for it. I’m definitely going to use one of the plates (full double-page spreads of A. Cellarius’ engravings, by the way) as the inspiration for my cover.